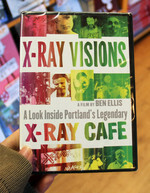 Ben Ellis is a former organizer of the X Ray Cafe, which was a small but influential music venue in Portland, Oregon from 1990 to 1994. The cafe was also the subject of Ellis' 2000 documentary. Ellis currently lives in New Orleans.